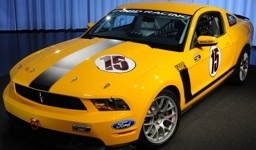 The 2011 Boss 302R Mustang is a non-street legal or track only car, limited to 50 units, a Ford racing option available for $79K, roll cage, safety harness, data acquisition system, race suspension, special tires, and side stripes. We don't think the color shown here is the new 2011 Yellow Blaze. This is a Ford promotional preview photo of the 2011 Mustang Boss 302R. The "R" stands for racing, since the car is not street legal. The 302R is limited to 50 units and is considered a Ford racing option available for $79K. Some of the features include the 2011 Mustang 302ci GT engine rated at 412hp, a seam-welded body, roll cage, safety harness, data acquisition system, race suspension, special tires, and side stripes. It was designed to honor the 40th anniversary of Parnelli Jones' 1970 Trans-Am championship (the GM, Pontiac, Trans Am was named after this racing series with much controversy at the time).